This is intended as a further developement of J.M. Pescado's marriage-traditional hack. When two sims get married/joined, the "marriagee" always get the same last name than the active sim (the "marriager"), who did the proposition. JMP did a mod which changes this fixed rule, so in opposite-gender marriages the female gets the male's last name, and in same-gender joined unions they retain their original last name instead. With my mod you may choose what to do in single marriages, indipendently by gender and selectability of sim spouses. 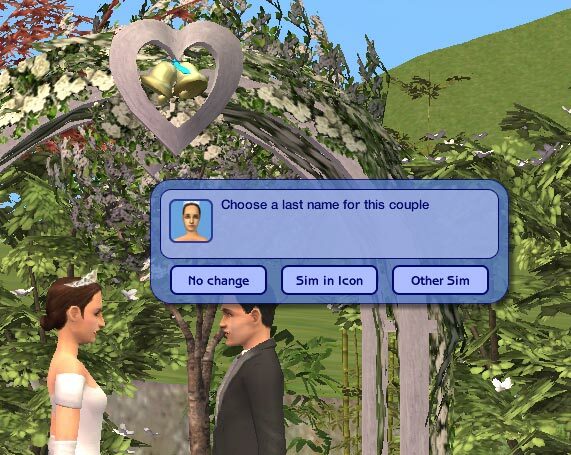 Just after the marriage, a dialog will pop up: you may choose to make no change (both sims will retain their last names), have them both the marriagee (shown in dialog's icon), or marriager one ("other sim"). This mod should work in base game as well as in any combination of EPs, Pets and Seasons included; if you notice any glitch, expecially in dialog strings (even if in other dialogs, not marriage-related) please let me know. Many thanks to J.M. Pescado; studying his mod was essential for me being able to even think of make this. Plus, I know he hates being thanked, and I couldn't resist ;D.
A HUGE thanks pile to linolino (for his BV update and Spanish/Portuguese translation), SimSanta1992 (for French and German translations) and Lord Darcy (for Korean translation, compression and general overlook to this mod). Last but not least, jfade for Compressorizer and general awesomeness. At last, I've installed AL and I was able to understand what's wrong with this hack; witchery really scrambled last names a lot. The AL updated hack is now fixed: I've tested it in pretty much every combination and it seems ok. Please let me know if I overlooked something, thanks for the patience! Fixed BV-FT version too: the first time I uploaded the wrong file ; please redownload. ~Requested~ Spam & Rice! 3 Course Meal!